La Roche d'Enchaille is a barn conversion located between the medieval market towns of Loches and Descartes; ideally positioned for exploring the Loire Valley and its Château. Set in to a hillside with a wood behind, La Roche d'Enchaille enjoys uninterrupted views of the surrounding rolling farmland and woodlands providing peace and tranquility. 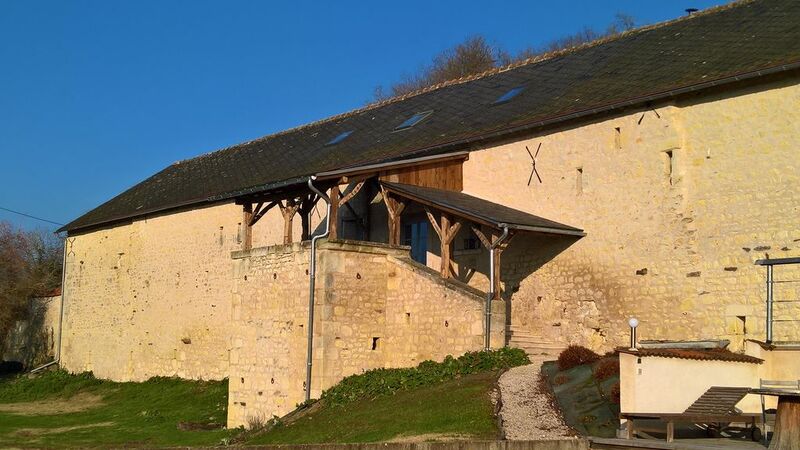 The accommodation is a careful restoration and conversion of the farm to the Château de Cussay, this dates back to 1268 when the first record of the château can be traced as being sold to Guy the Doyen of St Martin. The main West-facing wall is formed from the original château ramparts and vestiges of these are present through out the grounds as well as entrances to caves and tunnels. The locals swear there is a tunnel linking La Roche d’Enchaille with the Church in the centre of Cussay some 5 km away. The château had several roles during its long history, including operating as a mint striking coinage back in the 16th century and more recently as a “Relais de Post'. It now offers relaxed open plan living with a games room for table tennis and darts, a choice of out door terraces with a hot tub and sun lounges as well as dining areas. Liz & Garth created the gite at La Roche d'Enchaille together, having both previously worked in the service sector in the UK, Liz being the interior designer and finisher and Garth with his Construction experience undertook the conversion of the original Cow shed, with several additions over the years such as the Hot tub resulting in the comfortable accommodation that is available now. We holidayed here with our 4 children many times and have family connections to the area which always made it a special place for us and the contrast in the pace of life to were we lived in England made it an easy choice for us. The main bathroom is fitted with a Victorian style bath with shower attachment. One of the shower rooms is en-suite to the master bedroom and has a large open shower enclosure with glass screens as does the ground floor shower room both have level access There is also a separate laundry room located adjacent to the games area. Extensive open plan with plenty of grassed areas for ball games. Nous avons passé un excellent weekend dans cette magnifique maison très bien équipée. Make it a 6 star! If I could give this lovely, charming home a 6 star rating I would! We took our children and grandchildren on a 3 week tour of France. By the time we reached the Loire Valley, we were all travel weary. This was the perfect respite; sunflower fields, cows, and sunsets. On arrival we found a tastefully remodeled, spacious and beautiful home. The kitchen is perfect for cooking and is well stocked. There are toys, games and activities for the children, including an assortment of bicycles, a ping pong table and darts. The decor is simple, beautiful and tasteful as well as having the exceptional quality of not being fussy. I am an interior designer, and have a high standard. This clean and open concept home makes for a perfect gathering place. Your hosts are available and accommodating, yet you feel you are given the utmost privacy. Castle visiting was fabulous. My only wish was that we had stayed here longer! Truly wonderful!!! What can we say, thank you for such a glowing appraisal delighted it was what you needed. It is a lovely stylish Gite in rolling countryside, and yet only 10 minutes from the supermarket in Ligeul. We enjoyed every moment of our stay (despite appalling weather) and were made to feel very welcome by Elizabeth and Garth. Finally also recommended to wheelchair users. We have recently returned from 10 days stay at La Roche d'Enchaille. There were 6 adults and 2 small children in our party, and the gite catered for all of our needs. Everything we needed was right there for us; a superbly stocked kitchen, plenty of living space and beds for everyone. We were particularly impressed with the range of toys and books for our two children, aged 3 and 6. The house was perfect for the children with a huge amount of outdoor space, boules pitch, table tennis, darts, bikes etc. The gite has been restored to a very high standard, was very clean and the owners Garth & Elizabeth were on hand to assist whenever required without being obtrusive. Buster the friendly dog was a big hit with the kids too! Plenty of places nearby to visit; however we were just as happy to relax at the house. The sunsets over the surrounding fields are amazing! We would not hesitate in recommending it to others. Thank you Garth & Elizabeth for a most enjoyable holiday. Fantastic location and superbly equipped accommodation. The downstairs bedroom and shower room were particularly appreciated by my elderly mother. She lovely the fact that there was no step into the shower and the non-slip shower tray and described it as 'a luxury wet room which I will miss'. The kitchen was equipped to a high standard with a massive cooker, very good dishwasher and fridge. Upstairs bedrooms were very comfortable. Lots of lovely touches such as freshly laundered napkins, lovely cotton sheets with lots of pillows, piles of towels and bath mats, fresh flowers, etc. the terrace was lovely to sit on to watch the owl, kestrels, swallows, bantams, and the cows in the field. Buster is quite a character and we miss him already! Liz and Garth are great hosts and very attentive, whilst at the same time letting us feel we were totally on our own and we loved the peace and tranquility. Shops were close by and also great access to the road network which made the journey so simple. The only thing we would change would be the length of the stay - it was far too short - and we would have liked to have missed the gale in the English Channel on the way home! •Eating out – there is a large choice of restaurants in the area ranging from the in expensive 12€ for a 4 course lunch including wine to the Michelin starred Le Promenade at Petite Pressigny which is 20 min away and everything in between.•Châteaux - This is an excellent area for châteaux, there are several local to the immediate area as well as the more famous including Chinon, Loches, Amboise, Azay le Rideau, Chenonceau, Villandry, Langeais, Blois, Chambord, Rigny Ussy (the inspiration for 'Sleeping Beauty'), Valencay and Montresor. Some châteaux also perform Son et Lumiere shows during certain evenings of the holiday season. •Tours - Tours, the Touraine capital city, is full of history and art and the old town boasts cobbled streets and charming medieval buildings. For those of you who like to shop, the new part of the city has plenty of choice. It also has an interesting old quarter full of pavement restaurants. Even a day visit to Paris is possible as it is only 55 minutes.